Want to celebrate Easter in song? These worship tracks from today's leading worship artists all rejoice and reflect on the gift the is the message of Easter. Looking to celebrate Easter with a song? Celebrate the Risen Lord with the The Cross Was Meant For Me: Worship Songs of Easter! Featuring 12 songs that tell of the amazing gift of the cross and life of our Risen Saviour! 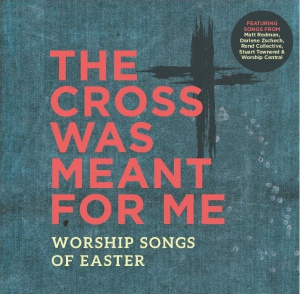 This collection highlights the most popular Easter songs and the original recordings of today's top artists like Matt Redman, Stuart Townend, Worship Central, Darlene Zschech, Tim Hughes, All Sons & Daughters, Paul Baloche, and many, many more. It is truly a "must have" collection that captures the power and life found in the sacrifice and resurrection of Jesus. The Cross Was Meant For Me by Various was published by Integrity Music in February 2018 and is our 4851st best seller. The ISBN for The Cross Was Meant For Me is 0000768712221. Be the first to review The Cross Was Meant For Me! Got a question? No problem! Just click here to ask us about The Cross Was Meant For Me. Now Playing: Praise the King Your browser does not support the audio element.